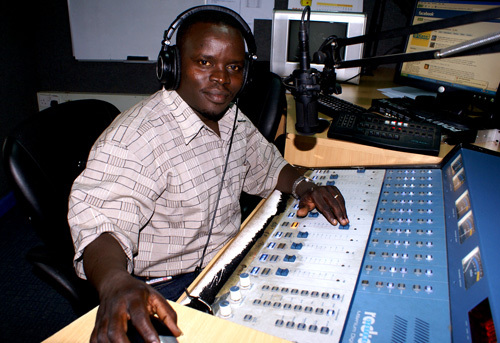 Former radio presenter Joshua arap Sang has broken ranks with two suspects with whom he faces criminal charges at the International Criminal Court and endorsed CORD’s presidential candidate Raila Odinga ahead of elections next Monday. We are away in a foreign land with my brother because of allegations made against us. The truth must be told. In my opinion, the people who masterminded and planned to have me and my brother taken to The Hague did not include Raila Odinga,Ã¢Â€Â Sang says. In the statement which Sang says he recorded because of Ã¢Â€Âœheavy feelings in my heart,Ã¢Â€Â the journalist traces what he terms Ã¢Â€Âœbroken MOUÃ¢Â€Â™s of the last two elections in Kenya, including the 2008 power sharing deal. Ã¢Â€ÂœToday, some of our people want us to enter into an MOU again through Jubilee. They never respected the MOU signed in 2002 and the power sharing deal agreed on in 2007.Ã‚Â Why should we expect that the one our community has signed in Jubilee will be respected,Ã¢Â€Â Sang says in a recorded message set to air on radio. Speak my brother speak do not be cowed, that's the truth of the matter. he is another victim..maybe promised that his case will be withdrawn…tunawajua. Any sane should not elect ohuru. Ohuru renage on all MOUs, both foreign and international. He will renage on the constitution and its review to favour him to remain president for life in Kenya as long as he stands accused at the icc. He will disobey his commitment to attend courts at the hague and remain at large like president of Sudan he will gang up with some african dictators in the region to safe his skin from the icc knife he not care what conditions will kenyans face, not even for the kikuyus who want to go grave ohuru coz he is one of them. Kenyans search for some common sense although common sense is not common. Any sane kenyan should not elect ohuru. Ohuru will renage on all MOUs, both national and international. He will renage on the constitution and he will order its review to favour him to remain president for life in Kenya as long as he stands accused at the icc. He will disobey his commitment to attend courts at the hague and remain at large like president of Sudan Omar Hassen El Basir, he will gang up with some african dictators in the regions to safe his skin from the icc knife he will not care about the conditions kenyans will face, not even for the kikuyus who want to go to grave becoz ohuru is one of them. Kenyans search for some common sense although common sense is not that common. releave your heat my brother, its painful bt say the truth. and the truth shall set u free. Thank you my brother finally you have seen the light God is in control it will come to an end pray hard until something happen in the ICC.God bless. Arap Sang finally speaks the truth! Truth be said my brother. Kwani sang amenunuliwa na how much. This the year of remission of sins and universal pardon, just speak out your. Truth be told, They broke the first in 2002 MOU, They broke another one for power sharing deal1 in 2007, to an extent where when Raila ordered the Victims of fire in Garisa to be compensated, the Minister for special programme said, she does not take road side orders, meaning they could not even respect the Office of the Prime Minister, whats makes us to trust them this time around, this time they need not to be trusted.